Innocent smoothies are THE fridge essential. If, like me, you are a vegetable girl and simply don't 'do' fruit then a large glass of Innocent smoothie every day will tick all the boxes. It contains 2 portions of your 5 a day, has no nasty added bits and tastes yummy (the banana and coconut is my fave). 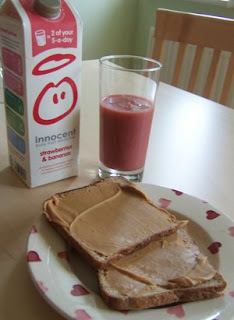 Innocent also does really smooth (for those picky palates who gag on bits!) individual smoothies for children, which contain 1 portion of fruit, in boxes of four - they're great for packed lunches. Plus, you get three alphabet fridge magnets in special packs. Neither are particularly cheap but you'll often find them on offer in one of the big supermarkets at any one time. Just thought I'd share it with you. 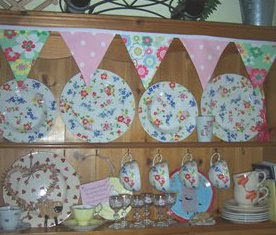 Oh and do you like the bunting I made today? It's Cath Kidston fabric, naturally. The green was actually an only-used-once tea towel I chopped up! Thrifty huh? Handsome hubby thinks our dresser looks like a CK shop display! 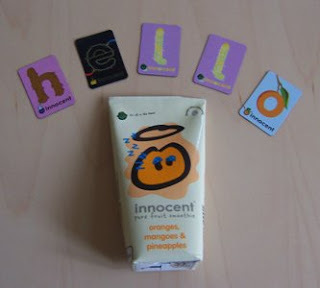 That is such a good idea about the Innocent drinks - I am not so good at the 5 a day!! Are you not just a cup full of pinky milky goodness. Thank you for my award and your kind words. I've been away and missed all the fun but thank you from a warm fuzzy tum!